In 1987 our family founded The Opening Door, Inc., an organization dedicated to promoting independence through travel. We Dukes have first hand experience in encountering the frustrations of traveling with a disability. Dad Bill has a hearing impairment. Mom Cheryl is a person of short stature and has a mobility impairment due to degenerative arthritis. Our son, Paul, uses a motorized wheelchair and is respirator dependent because of Duchenne Muscular Dystrophy. Caitlin, our daughter, is also a founding partner of the organization. She began working with the guide when she was 12 years old and has done typesetting, graphic design, on-site surveys, and helping with the development of the Accessible Virginia Web site, a companion to the Virginia Is For Lovers site. 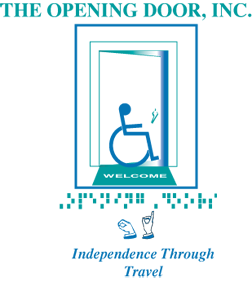 Our family business W. C. Duke Associates, Inc. is the developer of the Opening Doors® disability etiquette training program that is used by disability-friendly companies in the travel, hospitality, restaurant, lodging, airline, retail, and entertainment industries. Publish access guides for persons with disabilities. Consult with other states to help develop guides using their innovative format. Work cooperatively with the hospitality and travel industries to create an awareness of a large, lucrative consumer market--the 54 million Americans with disabilities plus their families and friends. If you like the comprehensiveness of Accessible Virginia please contact us for information on licensing our copyrighted accessibility questionnaires and templates for developing state and local guides. The Opening Doors, Inc.'s guide format has been registered and copyrighted internationally. In January, 2004, Virginia Tourism and The Opening Door, Inc. received an award from SATH (Society for Accessible Travel and Hospitality) at their World Congress on Travelers with Disabilities in Miami. It is the first award ever presented by SATH for such a publication and was given because The Virginia Travel Guide for Persons with Disabilities has been a pioneering effort in providing comprehensive accessibility information on travel and tourism for persons with disabilities.